Reference number for this case: 19-Oct-54-Mogueriec. Thank you for including this reference number in any correspondence with me regarding this case. Yesterday in the harbour of the river Aber-Wrach the sloop "Saint Yves" of Mr. Loguériec entered, whose sailor, François Floc'h was the witness, whereas he was at the sea, of an odd phenomenon. At about 4 o'clock in the morning, he saw above Valli, in Moguériec, a luminous sphere moving towards the west. The phenomenon lasted thirty seconds approximately, at the end of which the white ball disappeared suddenly. The same phenomenon was observed by a sailor of another trawler, Mr. Jean Roudaut, of the sloop "Mimi", which states to have been dazzled by the blinding brightness emitted by the sphere. 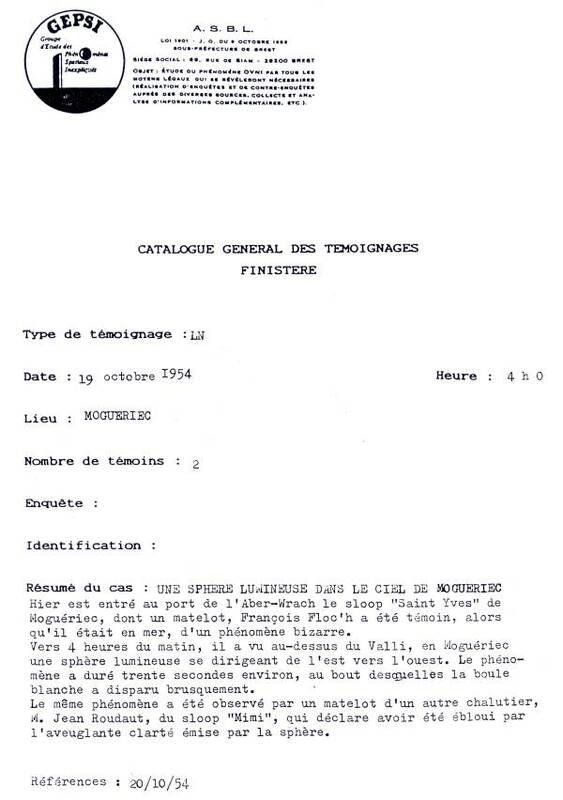 Luc Chastan indicates that in the Finistère in Mogueriec on October 19, 1954 at 04:00 hours "Around 4 hours of the morning the sailor of a sloop saw, abroad Moguériec a luminous sphere moving east to west. The phenomenon lasted thirty seconds approximately, at the end of which the white ball disappeared suddenly. The same phenomenon was observed by a sailor on another trawler who states to be dazzled by the blinding clearness emitted by the sphere." 1.0 Patrick Gross January 4, 2010 Conversion from HTML to XHTML Strict. First formal version. Addition [lc1].